It is thought that watermelon originated in the Kalahari Desert of Africa. The first recorded watermelon harvest occurred nearly 5,000 years ago in Egypt. Sometimes, they were placed in the burial tombs of kings to nourish them in the afterlife. From there, watermelons spread throughout countries along the Mediterranean Sea by way of merchant ships. 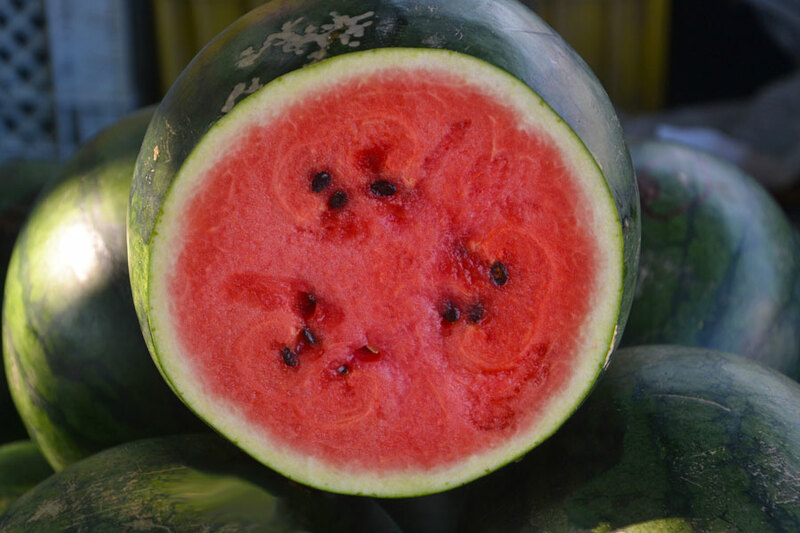 By the 10th century, watermelon made its way to China, which is now the world’s number one producer. There are more than 1200 varieties grown worldwide in 96 countries in various colours, shapes and sizes. Small-fruited watermelon makes great patio climbers, but they do need some support as they grow. Otherwise, they can be left to grow as a ground-cover crop through ornamental beds and borders. Watermelon grows best in full sun in a warm location. The soil should be average to fertile, humus rich, moist and well draining. Fruit develops poorly with inconsistent moisture and plants can rot in cool or soggy soil. To improve drainage, use raised beds or mound soil up before planting. Both melons and watermelons bear male flowers first. Female flowers will usually appear a week after and tiny melons will form just below the base of the flower. They prefer plenty of water during the growth and early fruiting stages. As the fruit is ripening, cut back on watering, the fruit tends to be more flavourful and sweeter. Watermelon is 92% water and thus low in calories. It has no fat or cholesterol and is an excellent source of vitamins A, B6 and C and contains fiber and potassium. Harvesting watermelon is often part art and part science. 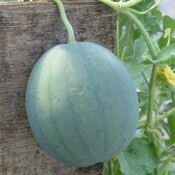 Some say, watermelon is ripe 35 days after the female flowers are fully open. Here are some other things to look for: •	Tendril on the stem nearest the fruit dries up and turns brown. •	Rind on the bottom of the fruit turns from white to yellow or pale yellow in colour. •	Top of the watermelon turns dull in colour and the contrast between the stripes diminishes. •	When you thump the watermelon, you should hear a deep, hollow sound. Keep ripe melons in the refrigerator for up to a week.